The following material is a brief excerpt from Ray Carney's writing about American painting. To obtain the complete text of this piece or to read more discussions of American art, thought, and culture by Prof. Carney, please consult any of the three following books: American Vision (Cambridge University Press); Morris Dickstein, ed. The Revival of Pragmatism: New Essays on Social Thought, Law, and Culture (Duke University Press); and Townsend Ludington, ed. A Modern Mosaic: Art and Modernism in the United States (University of North Carolina Press). Information about how to obtain these books is available by clicking here. There is almost always a social, realistic aspect to the work of nineteenth-century American artists, but it can also be as visionary, contemplative, or romantic as the most advanced twentieth-century European modernists. In particular, it is possible to discuss Eakins' or Sargent's portraits as realistic social and psychological studies of particular sitters. It is possible to discuss Hopper's paintings as social and psychological studies of personal loneliness, failures of communication, or the bleakness of the modern urban environment. It is possible to discuss groups of Homer's paintings (his series of schoolmarm and schoolwork paintings, for example) in similar terms. Such glosses are not wrong, as far as they go; they just do not go far enough, for the visionary side of the work of these same painters offers releases from the very categories of understanding with which these realistic analyses begin and end. To describe these works in conventional social and psychological terms is to fail to appreciate what is most radical about them, which is that the imaginative energies they release are unplaceable within their own realistic structures of representation. They generate intensities of emotion and imagination that will not be repackaged within tidy narrative bundles of character and motivation. On the other hand, the imaginative effect does not have to be gaudy and large to be disruptive of realistic categories of understanding. Especially in Hopper, Homer, and Eakins, a figure's inwardness or quietness that makes most him or her eludes the categories of realistic description. Consider Homer's A Fair Wind (also known as Breezing Up). His voyagers are embarked on an imaginative voyage as much as a seagoing one, but the crucial point to notice, in this painting about balance, is how Homer himself maintains the delicate balance between the counterpointed tugs of the two realms–the claims of the imagination and those of the world. Let me consider the figures as imaginative voyagers first. Notice that there is little or no sense of physical strain in their positions. Their bodies are relaxed, and they are released from the physical rigors of sailing a small boat in a high wind, almost as if they were transformed in fact, as well as in figure of speech, into Emersonian "transparent eyeballs." Unlike the figures in pre-Raphaelite works, however (and this is usually overlooked in discussions of the painting), not only are they embedded in the actual world: Their most salient aspect is that they are not individual, isolated visionaries but members of a small, tightly knit community. They may be rapt in their own states of contemplation, but Homer insists that, in the richest sense of the phrase, they are "all in the same boat." They are engaged in a complexly interrelated series of practical tasks: one holding the tiller, another holding the mainsheet, and the two others counterbalancing the craft. Each one's performance is necessary to keep the small vessel tacking smartly in the strong wind. Though discussions of the painting invariably refer to the figures' staring at the horizon, it seems clear to me that Homer has further emphasized the task-oriented interdependency of their practical performances by having none of them look at the horizon. The three younger figures are watching the luff of the sail and balancing the boat, and the older figure is paying attention to the roll of the boat and the course along which they are tacking. In short, rather than being a revelry in mere vision, the painting might be taken to be an allegory of America itself, as it was thought of by these artists: It is about the harnessing of individual visions to a complex, interrelated, practical group effort. Homer was guided by a belief that the life of the imagination could be lived not in contradiction to but in consonance with the most prosaic practical tasks. One notes the fish in the bottom of the boat. This visionary voyage has served to nourish more than vision. To oversimplify only slightly, the American idealist position (as descended from Emerson, through Homer, Eakins, and Sargent, to Capra, Ray, and Cassavetes) may be said to locate itself somewhere between the physicalism and optical allegiances of Degas, Renoir, and Monet, on the one hand, and the supernaturalism of the British late-Romantic or Edwardian tradition on the other. The distinctive differences between these three lines of modernism can be suggested, a trifle schematically, by comparing a pre-Raphaelite painting by Burne-Jones, Le Chant D'Amour, a painting by Homer, The Amateur Musicians, and one by Degas, The Artist's Father Listening to Pagans Playing the Guitar–all on the subject of music. The Burne-Jones is an exercise in spiritual incense burning. It is necrophilic perfume making, entirely dissociated from the actual smells of the real world. The Degas, in contrast, is a realistic psychological and social study of youth and age, action and meditation, artist and audience. The interest of the Homer painting is its ability, in effect, to marry the spiritually of the Burne-Jones with the tangibility of the Degas. As in the Degas, there are a pair of realistically presented modern figures (unlike the pseudomedieval ones in the Burne-Jones); however, Homer deliberately defends against the particularization of character, age, and relationship that gives Degas' work its strictly practical social and psychological meanings. Homer's figures avoid these physical and social significations in order to take on a more abstract, spiritual signification. (In many of his other paintings he does this–the equivalent to Capra's peopling his films with Smiths and Does and having them played by actors who embody "blankness" more than "character"–by deliberately angling the face of his figure away from the viewer in order to hide it, and by extension to universalize it.) A window, out of sight, above and behind the figures provides just the slightest nimbus of light around the heads of Homer's musicians to make their spirituality visible. (Capra used a key light on the hair of his actresses for the same effect.) In an earlier version of this painting, Homer put a Gothic window behind his cello player to suggest the degree to which this is a visionary painting, a painting about a spiritual opening out of an otherwise quite confining visual and social space (an imaginative opening out of social and psychological readings of the painting that Degas probably could not even entertain). Even in this medievalized version, it is significant, however, that Homer, unlike Burne-Jones, does not imagine his musicians passing out of the world of actuality through that window. He provides an imaginative window into a medieval courtyard, but life must be lived on this side of the window. These three paintings might be said to summarize the parting of the ways in early twentieth-century American art. Childe Hassam and Frank Benson elected to follow the path of Degas, Renoir, and Monet and adopt the methods of French Impressionism; Thomas Wilmer Dewing, Edmund Tarbell, and Arthur B. Davies went the route of the pre-Raphaelites into reverie, romance, and fantasy. It is my contention that Homer, Eakins, Hopper, and the other American Romantics whose work is the strongest managed to marry the energies of both traditions, the energies of imagination expressed in the world. 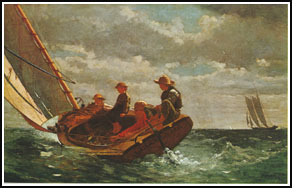 Contemporary reviewers criticized Winslow Homer's paintings of the late 1870s, invidiously contrasting his work with that of Monet, because the women in his pictures were not given clear social roles and statuses; because there frequently was an incongruity between their costumes and their facial expressions; because there was something imprecise and undefined about their activities and situations. In pointing out that Monet's or Renoir's women were seldom guilty of such vagueness of expression and activity, such mysteriousness and lack of social or psychological definition, they were only noticing the qualities that link Homer's central figures with most of Capra's and that make both of them distinctively American expressions. The vagueness, mysteriousness, and lack of definition, the strange staring off to one side, out of the (pictorial or cinematic) frame space at something undefined are registrations of the problematic expression in the world of individual consciousness for both artists, demonstrations of an awareness of what perhaps can never be expressed or rendered except through such mysterious vagueness. It is at this point that any attempt to assimilate the major artists in the so-called American impressionist tradition (Sargent, Hawthorne, Homer, Tarbell, Chase, Wiley, Johnson, Beaux, and others) to the theories and practices of French impressionism breaks down. For all of the superficial similarities of attention to color, light, and tonal values, the two traditions operate out of entirely different value systems. In a Metropolitan Museum catalogue, Dianne H. Pilgrim summarizes the prevailing conflation of impressionist and realist traditions in arguing, about the work of John Singer Sargent, that the effect he strove for was the "transcription of what was before him, defined by light and color." That could serve as a plausible beginning to an approach to the early French impressionists, but nothing could miss more of the essential quality of Sargent's work, which is, as I have already argued in Chapter 2, a study of the expression (or failure of expression) of individual consciousness in the forms of social life. To turn to Winslow Homer's work, one need only compare his Cotton Pickers or Girl with Laurel with Monet's superficially similar Women in a Garden. (If there were space for it here, one might with equal aptness compare Homer's Long Branch, New Jersey etchings with Monet's Terrace at Sainte-Adresse.) The Monet painting might be taken as a literal illustration of an art in which "The fruit trees look like women, and the women look like fruit trees"–that is to say, an art in which there are no awkward discontinuities between the human and the natural, no residue of consciousness that will not be completely translated into public, social, worldly action and expression. To reverse Isabel Archer's dictum, in Monet's painting, clothes–costumes, manners, gestures, and relationships–express the self perfectly (just as they do in paintings like Terrace at Sainte-Adresse). Monet and Madame Merle agree. Homer's work, on the other hand insistently calls our attention to the difference between flesh and spirit, the mismatching of physical or social and visionary occupations (literally in Cotton Pickers). Homer creates a gap between the specificity of the realistic details and the mysterious evocativeness of the expressions and oblique glances that makes the uneasy relationship of consciousness to ordinary life the subject of the painting. Monet, in effect, does the opposite, implying that there is no surplus of socially inexpressible consciousness, that everything that can be expressed is perfectly expressed by the costumes, poses, and manners of his figures. Homer's figures invariably look out of the frame space, beyond the physical world defined by their paintings. The presence of the wind and the horizons in many of his works, though not here, does the same thing: It beckons a viewer to look beyond social valuations and depictions, moves the viewer to an appreciation of an intangible, gentle sublimity in which the individual consciousness participates, separated from the group or the social task at hand and not communicable in effects of light and color. The result is a conception of the individual as in some sense "all dressed up with no place to go"–with a consciousness that potentially will not be expressed or translated into worldly roles, actions, or identities. The dreamer in Homer is ultimately compelled to turn outward or inward away from the social group and the realm of the senses to a state of meditation, reverie, or vision. Such framed rectangular objects on walls or openings through walls function in exactly the same way in Homer's and Hopper's work as they do in Capra's. They represent imaginative openings out of the confined, cramped worlds inhabited by the central figures, even as they function only as imaginative, and not actual physical or social, openings. Consider the effect of the window on one side of the boy doing his homework in Homer's Homework, the windows on either side of the schoolmarm in his New England Country School, the map, the windows, and the chalkboard hanging on the wall in his The Noon Recess, or, more generally, the use of window frames, ledges, horizons, railings, or other strictly demarcated physical boundaries in Homer's or Hopper's other paintings. Such boundaries or demarcated limits are invariably juxtaposed against or are used to frame imaginative or visual openings that represent potential escapes from the physical confinements of the space defined. The worldly boundary in each case paradoxically outlines the possibility of an imaginative hole that ruptures it or offers a movement beyond it. In The Noon Recess and New England Country School, Homer's bored schoolmarms, oppressively shut in by the physical walls of their one-room schoolhouses and the tedium of their days (just as they are compositionally shut in by the oppressive symmetries, repeated parallels, barren rectangularity, and visual tedium of the artistic spaces in which Homer situates them) are offered visionary releases (just as in much of Hopper's work) through the windows on either side of them. In The Noon Recess, the more interesting of the two works, Homer attracts our eyes outward through the windows by calling attention to the activity outside. Inside is confinement and stasis and silence; outside is movement and noise and freedom, and the echoing of the diagonal posture of the boys in the window behind the teacher with the teacher's own diagonally presented figure suggests her imaginative yearning for their state of freedom, free movement, and free expression, even as her looking in the other direction implies her inability to participate in their freedom. However, the movement that interests Homer most is not physical but imaginative. By positioning the map on the wall just over the head and to one side of his figure (a device previously employed by Vermeer), he tells us, in effect, that the subject of the engraving is imaginative movement. His teacher's glance outward is actually evidence of a meditative turn inward. The actual state of the children playing outside is unavailable to her and ultimately unimportant. In looking outside she is meditatively entertaining possibilities of escaping westward, literally or metaphorically, beyond both the school room and the children outside, beyond the physical, social, and expressive confines of school life altogether, imaginatively beyond all of the surfaces and figures rendered in the work itself. The work indicates its own expressive limits. Some of Homer's open-air compositions, such as The Dinner Horn and the Long Branch series of etchings and paintings, though they cannot use walls, windows, maps, or pictures in this way, complexly use the visual effect of juxtaposing a severely bounded foreground against an unbounded background space defined by a distant horizon to the same purpose. The eye is enticed into passing from socially costumed and encumbered figures, who are physically immobilized by a ledge or railing in the foreground of the painting (and formally immobilized by their placement within the composition, off to one side of it, or close to one edge of it) across and beyond these worldly and formal boundaries through the pictorial space to the sea or the unbounded horizon beyond. This is what might be called the transcendentalizing impulse in Capra's, Hopper's, and Homer's work. Figures physically, socially, and formally confined are offered imaginative releases from their entailment and immobility. The social body is (and must be) left behind in order to free the visionary eye to movement. All three are equally artists of the spirit whose spirituality involves spiriting the body away, dissolving the I into an eye. I emphasize that the common ground among the three is that the movements they are interested in are not social or physical but meditative and imaginative. One can look through a window or reach out visionarily toward the west or the horizon, but since one is not a transparent eyeball one cannot actually transport oneself (except in a visionary sense) outward along the line of sight or actually pursue one's own meditative path out of the world. George, on the edge of his group of friends, relatives, and neighbors, off to one side standing and listening to the ringing of the bell on the Christmas tree, is in the line of Homer's girl of The Dinner Horn, standing half within, half outside of the domestic space of her circumscribed existence and enticing our imaginations outward into the fields with the unheard sound of the horn she blows and to which she listens. The preceding material is a brief excerpt from Ray Carney's writing about American painting. To obtain the complete text of this piece or to read more discussions of American art, thought, and culture by Prof. Carney, please consult any of the three following books: American Vision (Cambridge University Press); Morris Dickstein, ed. The Revival of Pragmatism: New Essays on Social Thought, Law, and Culture (Duke University Press); and Townsend Ludington, ed. A Modern Mosaic: Art and Modernism in the United States (University of North Carolina Press). Information about how to obtain these books is available by clicking here.